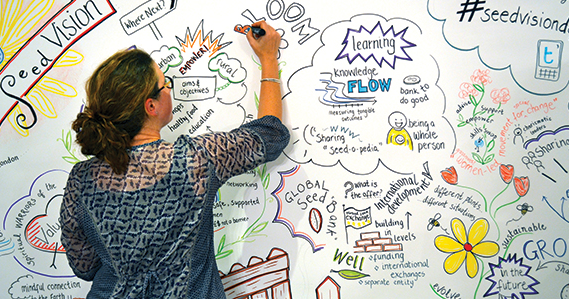 Claire Holgate, pictured here, is a freelance graphic recorder based in the UK. For five long minutes, the graphic recorder’s raised right hand was stalled over the paper in front of her, a stunning demonstration of the speaker’s failure to deliver useful content. Although knowledgeable and articulate, the woman at the microphone had already used up half of her allotted time – and she had said absolutely nothing of value. What was worse, everyone in the audience was acutely aware of this. Because adjacent to her lectern stood the motionless graphic recorder – a person paid to fill the billboard-sized poster in front of her with pictures and diagrams that represented in image form the message being delivered. The trouble was, the speaker had just spent way too much time metaphorically clearing her throat, thanking all sorts of people, and talking about her long history with the institution hosting the event. The graphic recorder – who had been drawing frantically throughout the previous speakers’ remarks in an attempt to keep up with the stream of concrete suggestions and stories – hovered over the paper, waiting… hoping… for something notable. Thanking others is an appropriately generous impulse, and appreciated by those who’ve gone to the trouble of organizing an event that brings people together. But when you’re asked to share insights in a restricted time frame during a packed conference program, all audience members – including, and maybe especially, the conference organizers! – want you to cut to the chase. Furthermore, because you only have one chance to make a first impression, it’s always smart to make sure that the first words coming out of your mouth deliver value. Consider the messages you send when you invest energy in coming up with an opening to your remarks that arrests attention. My research looks at mechanisms to enhance equity within the pedagogical environment and reduce attrition rates. I’m working to make classrooms safer so more kids stay in school. The added benefit of making sure that your opening sentence is content-rich and tailored to arrest the attention of people in the room is that the energy you get back in the form of their laughter, empathy or intellectual engagement is likely to dispel any lingering nerves you might have as a speaker. Starting the relationship off on the right foot does wonders for your confidence, and you can do worse than imagine that a graphic recorder is poised beside you, ready to make vividly apparent to the audience whether you’re sharing platitudes or gems, theoretical pronouncements or news-they-can-use. We’ll be looking for opportunities to make similar sessions available in more cities across the country. Let us know if you’re interested. In the meantime, check out the 3-minute video blogs we produced in collaboration with University Affairs magazine. COPA (the Canadian Online Publishing Awards) recognized the series at their annual conference last year. Here’s episode 2, focusing on the power of speaking in a way that helps audiences visualize your message.